There was a special delivery from Prima Deli before the long weekend. We received a box with the words " Give Life to taste" and could not wait to discover what yummy treats lies within. 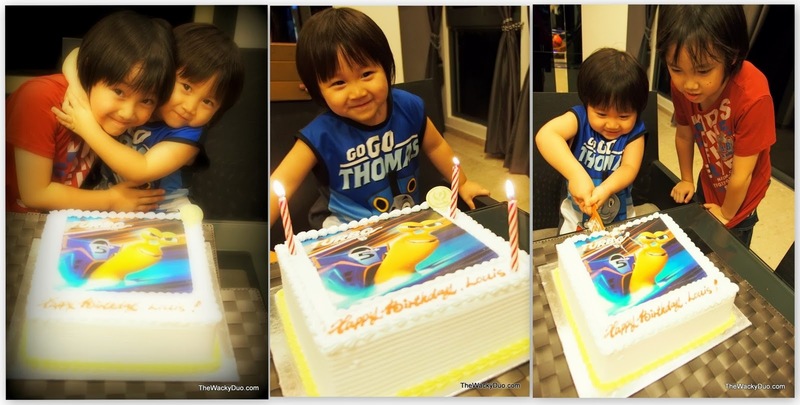 It was a cake featuring Dreamworks latest action star, Turbo. Turbo is a lovely story about a endearing snail with ambitous to become the greatest racer in the world.The cake was especially made for my birthday and I absolutely delighted by the sight of this colourful cake. The cake we had was the Turbo Charging cake. It features soft vanilla sponge covered with layers of light fresh cream, embellished with an image of Superstar Turbo on edible icing sheet! It did not take long for us to sing the customary birthday songs and cake cutting. 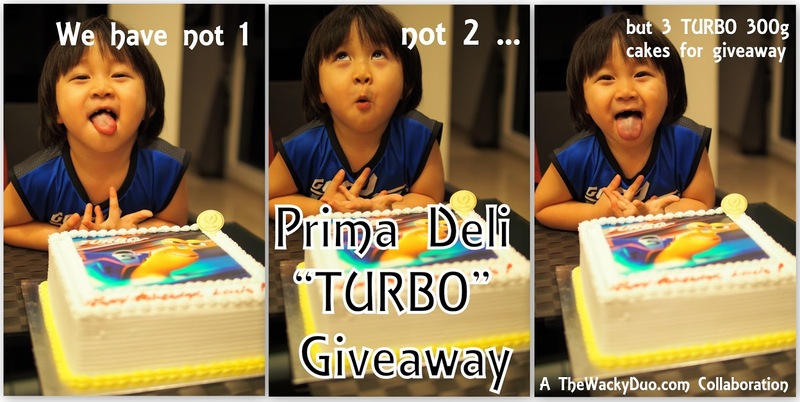 After making a wish and blowing off the candles, it is time to indulge in the Turbo cake. The cake itself is delicious.The cream is light and the vanilla sponge is suitable for most kids.We had is the 1 Kg version of the cake and it allows customising of words on the cake. The cakes can be customised to your own desire. Prima Deli offers a choice of vanilla or chocolate sponge base and a complementary selection of 11 tantalising fillings to choose from. Indulge in your choice of fillings for vanilla sponge which includes strawberry, peach, mixed fruits , blueberry, mango or D24 Durian. The fillings for chocolate sponge includes dark cherry, blueberry, hazelnut , chocolate fudge or truffle. The cake prices range from a very affordable $15 onwards for a 300g cake and $39.80 upwards for a 1 Kg cake or more. Designs of the cakes are subjected to the size that you choose. Prima Deli has a wide range of cartoon character cakes for birthdays, family occasions or simply "sharing these little treats in life with those you love". 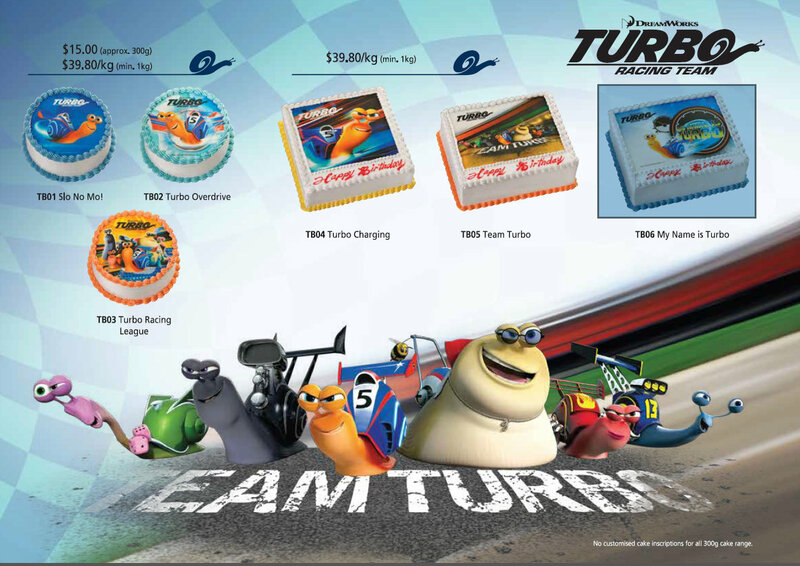 There are six specially designed cakes, either featuring racing star Turbo or Turbo alongside his trusty companions - Chet, White Shadow, Whiplash and Smoove Move to choose from. 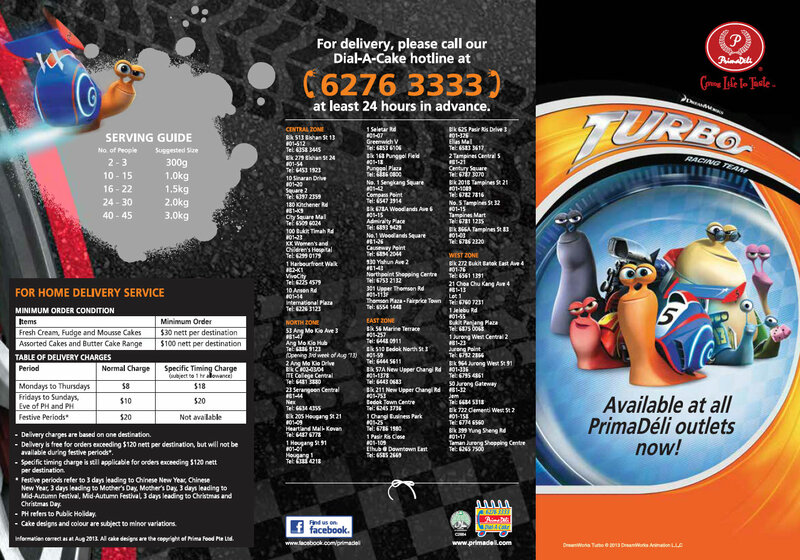 So if you are looking for a cake by Turbo, Shrek, Madagascar, Barney, Dora the Explorer, Strawberry Shortcake and more, do head down to any of the 38 branches of Prima Deli to check out their range of Cartoon cakes. You can also make a booking online or via their hotline at 6276 3333. Share this entry via this picture(as above)on Facebook. Tell us what you love about PrimaDéli (e.g. love the taste, design,etc) at our facebook picture link on this giveaway after you have liked and shared. Be Creative and we may just take special notice of your post! Winners to respond by 22nd August 2013 on delivery details, else giveaway will be forfeited.